Are they knuckle, or hook and loop? If they are knuckle, kadee has a number of different configurations. You might check with them. Or get hold of a recent Garden Railways magazine and call some of the dealers who have ads in there. Have you tried running it with the new layout? If the track connections are tight, it should work as long as you don't add more cars or a grade. If that is going to be the extent of your layout, I'd recommend a 3 or 5 amp power supply. Many of the "G" gauge sellers on the internet should be able to help you. This would allow you to pull more cars. Look at the previous thread on NEW TO G. A lot of this has been covered in that thread. I assume your layout will be indoors. Your track will rust badly, if you use it outdoors. In your original post you also asked about powering your railroad. There are several options, as said by Jerry. In my opinion there is no single system that is best in all situations. 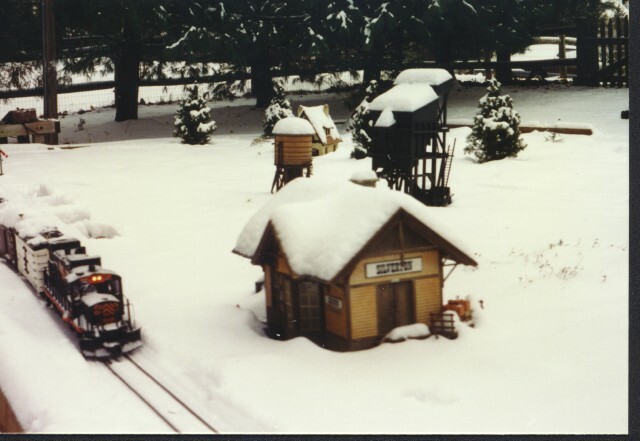 I built my first garden railroad in the early 1980s in Lakewood, Colorado. I had two loops that were separated by about 2 feet in elevation. They were connected by a cog railroad. I ran all three independently on track power. I have been using track power ever since. I only run one train at a time on a single mainline. Here in Virginia I have a single mainline and in front of the station are the mainline and two through passing sidings. I can have three trains out, but can only run one at a time, still using analog DC track power. For me that is fine. If you look at the picture of the stream liner with the GG1 you will see about 1/3 of my layout. The picture of the 3 Bachmann engines shows the mainline and the two passing sidings. If I wanted to run two or more trains on the mainline at the same time, or I wanted to use all the sounds available, I would have to go to DCC. For me I don't see any advantage to go to DCC. I have several engines with battery and RC. I run them on the home layout, but their main purpose is to run trains on other layouts that don't have track power. As to power supplies, the one that came with your set will pull your train and not much more. Any grades or more cars, smoke, sound, will add to the current drain. That power supply is about 1 amp at best. Think about what type of trains you will be running in the future. I figure about one amp per motor in the engine. Some engines have 2 motors and some have 4. Lighted cars pull current. My USAT streamliners each pull about 1/2 amp. The streamliner in the picture is probably pulling about 10 amps. Is it better to buy a 10 or 15 amp power supply now and be covered for the future, or buy a smaller one and then get the larger one when you expand to bigger engines and trains? My recommendation is to start with track power and see where you want to go. Also join a local club and pick their brains. Go to open houses and ask questions. One on One with people using the various power options will help you come to a decision. Just take your time. I have remote control of my train. I'm using a Meanwell 24volt/15amp power supply and a Bridgewerks, Ur-15 controller between the power supply and the track. G-Scale Graphics has a similar remote controller. I don't have one, but I have heard good things about it. Looks as if I exceeded my limit in the previous post. Here are a couple more. Now a couple of picture from our Arizona layout,with a mixture of buildings. A lot of 1:22.5 rolling stock is closer to 1:24. If you are going to scratch build buildings, it is easier to use 1:24 as it is half inch to the foot. No scale ruler is needed. 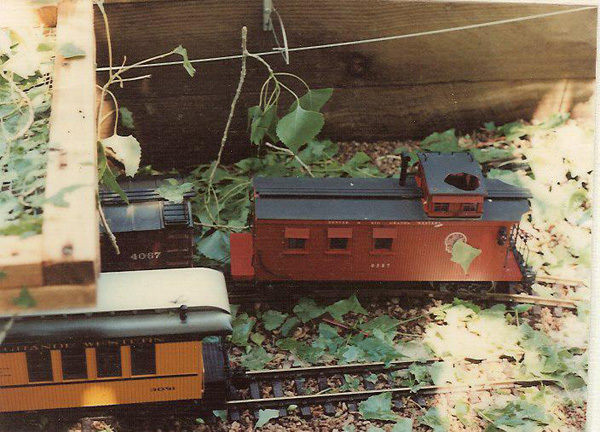 On my outdoor layout, in Virginia, all the buildings are Pola or Piko. I run 1:20.3, 1:22.5/24 and 1:29 scale trains. The coaling tower, water tower, signal tower, and station are the only trackside structures. All three scales look fine with the buildings. In "G" gauge most of us use the 10 foot rule. If it looks good from 10' away, it looks fine. On my winter layout in Arizona I run exclusively 1:22.5/24. There is a mixture of Pola, Piko, and wooden bird houses and other structurers that looked appropriate. When looking at buildings for train I measure the height of the front door. If it between 3 and 3 1/2 inches tall it will work. Keep your eyes out. We we got a jail and a general store in a trading post in Winslow, Arizona and a cool Navajo hogan at a trading post in Saunders, Arizona. The latter three are wood and I wouldn't leave the out where they could get wet. They were all less than$50. That is a lot less than a kit. Are you planning an indoor or outdoor layout? Here are some pictures of my Virginia layout. 1:29 train passing a 1:22.5 Pola station with pola water tank, coaling station and engine house in the background. here are three Bachmann 1:20.3 engines in front of the Pola station, right to left, K-27, Connie (2-8-0) and Shay. I doubt your track is 0.33mm. If it is AristoCraft it is most likely code 332 (0.332" tall, just the rail). That size rail is made by several different manufacturers, USATRAINS, LGB, Piko, Train-Li, and Bachmann. They are all interchangeable. There are different tie spacings. The Bachmann steel track is fine for indoors, but it will rust very quickly outside. What is the diameter of a circle made with your curved track? If it is 4', I'd recommend going to a larger diameter curves. 4' diameter is fine for occasional use, like under a Christmas tree, but for regular use on a layout it puts a lot of stress and wear on the wheels, gears and motor. Most, if not all plastic building kits, Pola and Piko, are 1:22.5. According to Bachmann the new Climax will work on 4' diameter curves or greater. Since my 2-truck Shay is no longer on the website, anyone know what the minimum radius/diameter might be. Open the 3-truck Shay page. Click on one of the 3-truck shays and it is at the bottom of the description. I clicked on the bottom one. I tried to paste a link to the bage, but it didn't work. I have heard that you should always have slip joints on the inside of the curve if you are using 4' diameter curves. If you have them on the outside, they may come apart. My curves are all 10' d and on them it doesn't matter, but I only have a 2-truck Shay. It sure would have helped if you had mentioned earlier that you have 4' d curves. PS The Bachmann website (online store) says that this model works best on 8' diameter or greater curves. Looking at the parts diagram of the water bunker, it looks as if there might be a screw that holds the truck to the frame. There seems be be a bracket between the power block and the bottom of the bunker. If you can get into that assembly you might be able to loosen the screw. Although, for the life of me (and Jerry) I can't figure out why you would want too. My only guess is that might be needed for 4' diameter curves. It looks like it is part #00101. There appear to be 4 screws that hold it to the bottom of the bunker. You would need to remove the 4 screws and add a single one in the center. I accept no responsibility regarding the above suggestion. It would be best if someone from Bachmann would clear up this confusion or post a link to the 3-truck shay video. Are you sure that your video isn't for the two truck Shay? The instructions are very similar. The fuel/water bunker on the two axle Shay, looks a lot like a water bunker. Especially if the coal bunker hasn't been put in. I agree with Jerry and Kevin. The water bunker is at the end and is not rigidly attached to anything but it's self. The length of the water bunker and its wheel base is very short. There is no need for it to rotate. It is about the same length of the 2-axle mine cars. These are the wheels on those are fixed to the body. Those cars are designed to go around very tight curves 4' or even less. Three hours of mid to late afternoon sun shouldn't be a problem. I've read comments here that LGB ties have the best UV protection. Most of my track is LGB with the exception of my main line curves. They are AristoCraft 10' diameter sectional track. I put my track down in 1994 and it is still fine. I have heard that there was a batch of their track where the ties didn't have UV protection. They exchanged sun damaged tie strips with ones made of better plastic. That would have been a major PITA. I think that they corrected the problem and newer track should be OK. I think, with that exception, you would be fine with any of the current track manufacturers: LGB, USAT, Train-Li, Piko, and Aristo (recently made). Accucraft, LLagas Creek, and Sierra Valley also make track, but except of switches, I believe that it is all FLEX track so you would need a rail bender for your curves. If I lived there I wouldn't worry about fading, under normal use. If you lived in central or southern Arizona, or at high altitude, such a Colorado and northern Arizona (Flagstaff) it could be a problem if cars and engines were left out for extended periods of time. Your picture shows trees, if they are positioned to provide some shade to the layout, that is a plus. Caboose (Delton) and coach (LGB) after a hail storm. Where do you live? Your regional climate will effect everything. If we knew where you are located, we could offer better advice. Arizona effects things differently than Maine.